This may have been the most anticipated book since Harry Potter and the Deathly Hallows. Thirteen publishing houses fought for this book. YA movie queen Amandla Stenberg signed on to star in the movie of this book before it was even published. It has been on the New York Times bestseller list for 17 weeks, many of them at No. 1. I bought it during release week and only recently got around to it, partly because the subject matter is heavy and I had to steel myself for it a bit, and partly because my expectations were so high, I didn't know how I'd possibly review this beloved book if I didn't absolutely love it. But oh my gosh, this book is amazing. Two pieces of context are relevant when going into this book. It's inspired by the Black Lives Matter movement and events predating the activism around policing being called Black Lives Matter; and it derives its title from Tupac Shakur's THUG LIFE tattoo, which stands for "The Hate U Give Little Infants Fucks Everybody." This phrase is discussed throughout the book and is an important theme in the story: how the bigotry black children face their entire lives perpetuates a negative cycle that hurts the black community and hurts everyone. With most books I read, I wish this and this and that had happened instead. 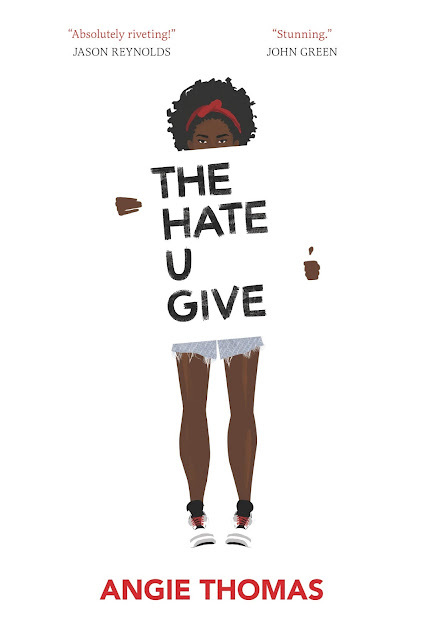 With The Hate U Give, I felt that at some points, briefly, and then I realized everything happened perfectly for the story Thomas was trying to tell. Everything about this story is intentional and thoughtful. There's no angle of this issue that Thomas didn't explore. People who want to deflect and say, "But what about gang violence and black-on-black crime?" (I need a shower after typing that phrase, for real.) Angie Thomas addresses those issues head-on so you see that, yes, there are gangs, there can be violence — like in any community — but there are more often than not people who fall into that life out of desperation and financial need. And I love that Thomas didn't shy away from that. I love that there were incredibly sympathetic characters and incredibly antagonistic characters who illustrated both sides of that, because it passionately defends the fact that Khalil and people in Khalil's circumstances don't deserve to die during a traffic stop just because they've done bad things. It's like when people talk about immigrants contributing to society as doctors or scientists and how we should embrace them for those reasons. I wish I could remember and cite the awesome Twitter threads I read about how respecting someone's humanity shouldn't depend on what they do for employment. Starr and her family and friends were portrayed with so much depth and compassion. Yes, they live in a "bad neighborhood." And yet, Starr and her siblings go to private school and excel at everything they do. They have neighbors who help each other out. Yes, Starr's daddy did time. And yet, he's a successful business owner who cares about his community and creating opportunities for people who live there. Yes, we see Starr not quite fit in with her black friends or with her white friends and have to code-switch constantly. And yet, she does find ways to be authentic in her complex world. Yes, Starr fears cops because of what happened to Khalil. And yet, we meet cops in the story who do their jobs with the integrity and care we should expect from that profession, the higher ideals we all want to believe about people meant to protect and serve. And oh MAN, the choice to make Starr's boyfriend white? I really didn't know which direction that would go with the events of the book, but I was so, so happy with how it all went down. Starr and (most of) her friends were such precious babies, and I just want to protect them and make fan art for them and read sequels and spinoffs about them. This is such a great book. It's full of warmth and humor amidst such deep sadness. Everyone should read it. Read it if you're black. Read it if you're white. Read it if you're in an interracial relationship. Read it if you are ready to examine honestly your feelings about race and class. Read it because it deserves the hype, and because it matters.